News matters. It is still the main forum for discussion of issues of public importance. It is where we come together to inform, persuade, influence, endorse or reject one another in a collaborative process of making meaning from events. But the news is changing - content, distribution channels, geographical constraints, production values, business models, regulatory approaches and cultural habits are all in flux, as new media technologies are adopted and adapted by users. However, despite having driven many of the changes themselves, established media organisations are in many cases struggling to adapt to this changed environment. 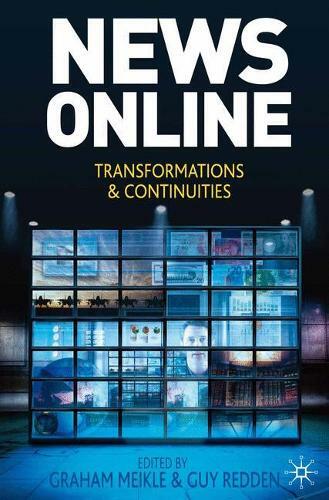 News Online: Transformations and Continuities is for everyone who wants to better understand the news media of the twenty-first century. With contributions from leading international scholars who question established understandings of news in the light of change, this book charts a course through recent upheavals and ranges over a broad terrain - from the BBC to experimental videogames, from Latin American newsrooms to Northeast Asian blogs, from the crisis in US newspapers to Twitter users in Iran. Each chapter provides an insightful analysis of how popular digital communications change relations of production and consumption, in addition to the effect on cultural and political participation. News Online considers the shifting boundaries between the popular and the professional made possible by the redistribution of news functions. Graham Meikle is Senior Lecturer in the Department of Film, Media & Journalism at the University of Stirling, UK. He is the author of Interpreting News (2009) and Future Active: Media Activism and the Internet (2002). Guy Redden is a lecturer in cultural studies at the University of Sydney, Australia. He has previously taught at the University of Lincoln (UK) and Prince of Songkla University (Thailand). His research revolves around the relationships between culture, media and economy. Stuart Allan, Ian Bogost, Axel Bruns, Andres Canizalez, Kate Crawford, Mark Deuze, Natalie Fenton, Simon Ferrari, Leopoldina Fortunati, Gerard Goggin, Jairo Lugo, Robert McChesney, Brian McNair, An Nguyen, Bobby Schweizer, Einar Thorsen, Tamara Witschge and Xin Xin.